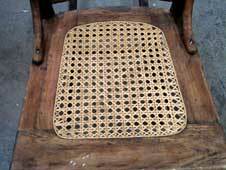 Many modern and antique chairs have cane or rush seats - these wear out, get stepped on and become broken. We offer a full service caning and rerushing service. 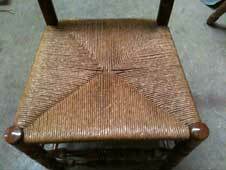 Also, splint and woven seats or chair backs can be restored. There are two basic types of caning and they are not interchangeable - a chair is designed to have one or the other. Hand cane: The cane is woven in single strands through holes in the perimeter of the seat (or back), and you can see the knots tied on the other side. We charge by the hole for hand caning. Just count the holes around the perimeter of the seat. The average hand cane seat runs $145.00 to $185.00. French peg cane: The same as above, but the holes don't go completely through the seat or back. This type of caning requires that each strand be kept in its hole with a peg. Very difficult! The average seat runs $205.00 to $345.00. Of course there are special cases or difficult jobs - two sided French peg or medallion french peg - simply bring the piece in for an estimate. 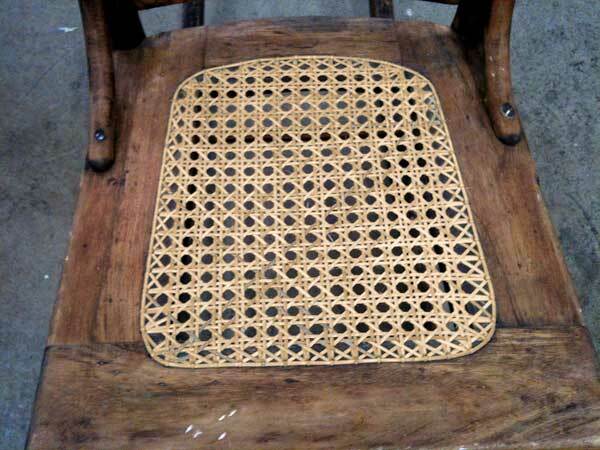 Machine cane: This comes in a pre-woven sheet and is applied to the chair seat or back as a single piece, held into place by a wooden spline in a groove around the perimeter. The average seat runs $125.00 to $145.00 to recane - chair back runs usually $155.00 to $185.00. 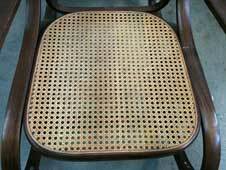 If the cane is glazed to a deeper, darker color - often matching the wood - there is an additional charge (normally $30.00) to custom mix the glaze and apply to each chair. Rush: We use a Kraft paper rush - available in 3 diameters and over twenty colors. We currently charge $10.00 per inch, measured across the front edge of the seat, plus $30.00 if you would like us to shellac it. This step is required to protect the paper rush. Rocking chairs and large chairs cost more because of the increased seat size. "Real" cattail rush is rarely available - it is very seasonal and very expensive. It can be done, but please call to determine how timely and costly it would be for your chair. Also, Hitchcock chairs with wood trim boards on the outside of the rush will have an additional charge to remove and replace those boards. Some bow back chairs need to be disassembled to rerush the seats and then reglued complete- very labor intensive and will have additional charges. Splint: Normally Ash, but occasionally other woods, this product is similar to cane, but much wider - up to one inch. 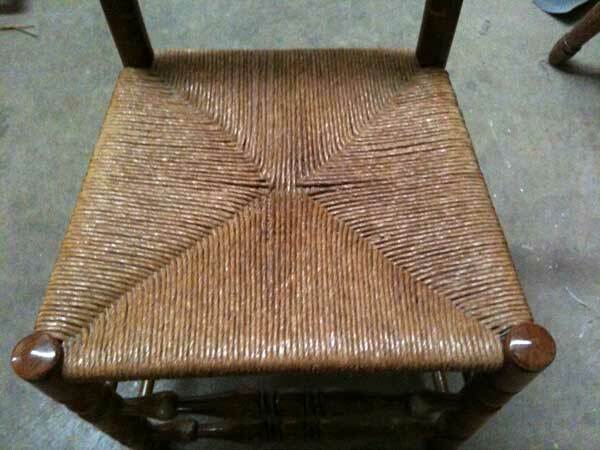 It is woven into the seat or back in a herringbone or criss-cross pattern. After weaving it is stained and lacquer topcoated. Danish rope: This appears to be much like woven rope, 1/8" to 3/16" in diameter. 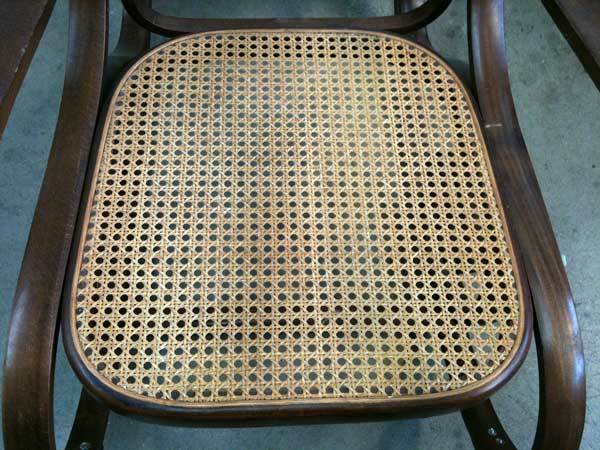 It is applied in an intricate design to the seat or back, and as the name indicates, is most often seen on contemporary Danish chairs and rockers. Flat Fabric: This material is available in many colors, and is most often applied in a checker-board pattern. There are several other forms of chair seats and backs. If you are unsure of what you have, please bring your chair by the shop and we will help you determine what it is and how we can help you. We also sell cane, rush, and other supplies to the do-it-yourselfer - please bring your chair in so we can help you find the right materials to do your project. As always, we'd be happy to give you free advice, just call the shop at (303)798-3220.